Don’t Be A Monster is the largest 501(c)(3) nonprofit organization that works alongside Haunted Attractions in the United States. We offer unique and entertaining anti-bullying assemblies for students in 4th-10th grade. For 2018, we are excited to announce that our presentation focuses entirely on cyberbullying. Our mission is simple: we work to educate and empower youth to be leaders around diversity, inclusiveness, and show them how to stand up for their friends and peers. The bullying prevention assembly is delivered in the months of late September through November, during National Bullying Prevention Awareness Month and the Halloween season. 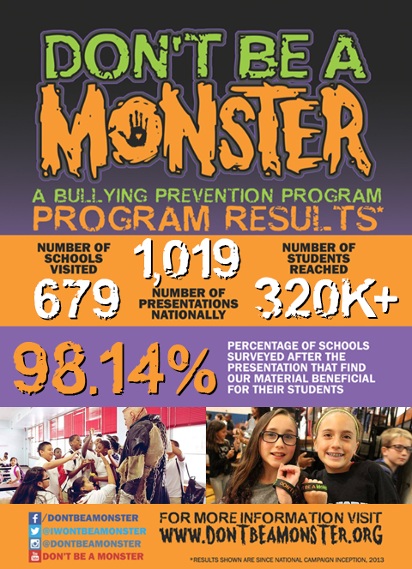 Don’t Be A Monster’s program is highly effective: 98.14% of schools surveyed post-presentation find our material beneficial and memorable for their students. We believe in a positive, proactive approach. Students leave our presentations equipped to have an educated and empathetic discussions with their peers. For more information, reach out to us at info@dontbeamonster.org. Click here to schedule a presentation. Do you do presentations in ____ city? Don’t Be A Monster is limited to doing presentations only in cities where we have existing markets. We are unable to do presentations outside of these cities. Currently, we offer presentations in Anderson, IN / Atlanta, GA / Austin, TX / Caldwell, ID / Chicago, IL / Cleveland, OH / Denver, CO / Detroit, MI / Dubai, UAE / Kansas City, MO / Lake Charles, LA / Louisville, KY / Phoenix, AZ / Salt Lake City, UT / San Antonio, TX / St. Louis, MO / Seattle, WA / Ulster Park, NY / Waukesha, WI. Outside of the States we work in Dubai. If you are interested in bringing bullying prevention materials to your school, we suggest exploring StopBullying.Gov, Pacer Bullying Prevention, and the Olweus Bullying prevention program. Are your presentations appropriate for students in KG – 3rd grade? Don’t Be A Monster is a presentation geared for students in 4th-10th grade. Our mascot is a Frankenstein-inspired character named Frank. In the past, he has been frightening to students under 4th grade. He isn’t a scary or mean character in general, but he has a large presence that can startle younger kids. Additionally, each of our presentations are sponsored locally by haunted houses. The haunted house covers the costs of attending schools, so that is why it’s free to most schools. Due to the mention of the haunted attraction, most students get excited about visiting a haunted house and it creates a buzz in the school. Most 4th graders are a reasonable age to attend a haunted attraction. KG -3rd grade are a bit too young for that. We do not encourage students younger than 4th grade attend the presentation. Why are presentations $200 in San Antonio and Austin but free everywhere else? We have been in the San Antonio/Austin markets since 2013, and are fortunate to have our program very well received in the area. Because of that, we receive about 3 times the booking requests in San Antonio/Austin than we do in other markets. We have had to hire a larger crew so we are able to visit every school that would like us to present. The $200 fee does not begin to cover our costs associated with each school, but allows us to not have a wait list for presentations. We hope we are still able to visit you in that area! What is covered in your presentations? * Finally, we finish with a slide with 3 resources for students that may be struggling. They are To Write Love on Her Arms (a self-harm organization), The Trevor Project (a LGBTQ organization), and the National Suicide Prevention Lifeline phone number. I hear your wristbands have the National Suicide Prevention Lifeline phone number on them this year. How did you come to that decision and can we opt out of receiving them? In our experience, students who need serious help are less likely to reach out and ask for it. We wanted to provide help in the hands of each student we work with. The inside of the bracelet says “you matter” and provides the National Suicide Prevention Lifeline phone number. During our presentations in the past, we have had students as young as 4th graders approach us with some serious questions. We have to image there are some that don’t feel comfortable approaching someone. While we completely understand that this may be an uncomfortable topic for some, it is so very important that we are there for these kids that need help. You are more than welcome to opt out of receiving the wristbands. When you schedule your presentation, simply let us know your school is opting out and we will not bring them. My students saw your presentation last year. Will they be seeing the same presentation twice if I book you again this year? Absolutely not! While the themes of bullying prevention and our general “Halloween-themed presentation” remain constant, our content is completely new and our presentation is built from scratch each year. We include at least one new video, update statistics, and generate up-to-date and relevant information every year. Almost all schools we visit book us every year. Can I volunteer at a presentation? Unfortunately, we are rarely able to bring volunteers to presentations. Schools we visit often require background checks, and we prefer to have them run a batch at the beginning of September to keep things simple on all ends. We are unable to allow volunteers into schools for a one-time presentation. A volunteer must commit to work with us the beginning of September through November. My kid attends a school where you are presenting. Can I come watch the presentation? That is at the discretion of the school. We welcome parents to attend presentations. I want to host presentations in schools in my city. How do I make that happen? I am an individual and want to help out. What can I do? Thank you for your interest! Individuals that are interested in our program can support us through organizing fundraisers (Facebook has an easy way to do that. Find out more here. You can also purchase merchandise from our online store here. Finally, spread the word about our program! Post on social media and tag us when you do. I want to donate a product for you to auction at one of your charity auctions. Who do I contact? Our program director, Erin, would be thrilled to help you! Her e-mail is Erin.Kelley@dontbeamonster.org. We sure do! Find our online store here. I run a company and would like to donate a portion of my proceeds to your organization. How do I do that? We would be honored! Reach out to us at info@dontbeamonster.org and we will provide you with a donor form as well as materials so you may promote your involvement with our organization. We would love to share your fundraiser on our social media pages! I tried to look up your charity to verify its legitimacy, and I didn’t see an entry for Don’t Be A Monster. What gives? Our official company name is Imagine Better, Inc. and our registered trade name is Don’t Be A Monster. When verifying our organization, please do so by either searching for “Imagine Better, Inc” or by EIN 46-3239540. You may also visit our GuideStar profile (national charity watchdog organization) here. How do I make a donation? What will my donation be used for? Donations can be sent to our organization in a few different ways. Send us a check. We do not lose a % of the donation that way, and is our preferred way to receive donations if possible.. Checks should be sent to Don’t Be A Monster 3400 E 52nd Ave, Denver, CO 80216. The majority of our donations go towards covering costs associated with putting on presentations for school. This allows us to keep the presentations free for schools. The haunted attractions provide the presenters, Don’t Be A Monster handles logistics, follow-up, and presentation materials. If we didn’t answer your question here, e-mail us at info@dontbeamonster.org. Thank you! We are now scheduling assemblies for September through early November 2018. Click here to schedule your assembly. Please note that requesting an assembly does not guarantee we will be able to visit. Please wait 2-3 business days for a confirmation from the Don’t Be A Monster team. What:Don’t Be A Monster is a 501(c)(3) nonprofit that was founded by haunted house owners and runs an engaging bullying prevention assembly that is put on by actors in the haunted house. We have an iconic mascot named Frank that is a huge hit with students. Our presentations are creative, and a lot of fun for students during the Halloween season. Cost: Free with the exception of San Antonio and Austin, where presentations are $200. When: Late September through early November. Availability varies across markets. Who: Students in grades 4th – 10th, though some cities limit the range. How Long: 45 minutes per ~300 students (but we can also present to an entire school at once). Depending on the city, some presentations are one hour long. Content: Our assembly focuses on cyberbullying and the role of an Upstander. We help students identify cyberbullying incidents. We discuss truths/myths around cyberbullying and talk about its lasting effects and why it is so dangerous. We bust myths about usage of Facebook, Twitter, Instagram, Snapchat and more. Additionally, students learn ways that they can be an Upstander in school. We show a short video and have a 45-minute powerpoint presentation. We also encourage schools to have a meet-and-greet with our icon character Frank. Students love meeting him! Here are two short video that will give you a better idea of what we do: watch this or that video.